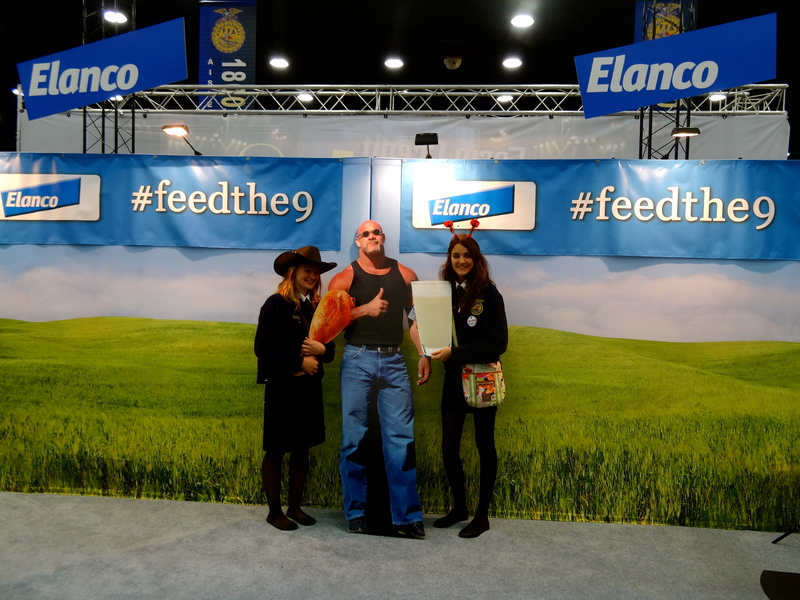 Brooklyn Stall (left) and Maddison Clements (right), from the Jefferson FFA Chapter in Missouri, help share Elanco’s #feedthe9 message. As demonstrated by his career path, former NFL lineman and champion wrestler Bill Goldberg is always ready for a fight. But, this year, his fight has turned from one over physical strength and athleticism to the fight over one of the biggest problems facing the world today: Hunger. Sponsored by Elanco and Nutra Blend, Goldberg now serves as the spokesman for the “Chew on This Tour,” an interactive road show traveling the nation to ignite awareness about hunger, as part of the “Drive to Feed” campaign. Goldberg serves as an intermediary with the public and food producers by asking and answering questions about hunger and food production. The tour made a stop at the 86th National FFA Convention & Expo, giving an estimated 4,000 FFA members and guests an opportunity to watch an informational video and speak with representatives from both sponsoring companies. The video features members of the public, Goldberg, himself, as well as Elanco and Nutra Blend presidents Jeff Simmons and Mike Osborne, respectively, alongside veterinarians and nutritionists. This year’s national finalists for FFA Star Farmer – Tyler Vathauer, Tyler Linneman, Tyler Loschen, and Vance Zachanas – collectively agreed about the need to close the information gap between food producers and consumers; they believe this “Drive to Feed” campaign will be an effective means to fill this void, and look forward to bringing its message back to not only their FFA chapters, but also their communities and political representatives. “We need to find a way to explain our technology, and to become more proactive within our political environments, as they’re the driving force in our policies,” said Linneman. “Like the Farm Bill currently wavering through our Congress,” added another Star finalist. This is where FFA members, including the Star Farmer national finalists, come in. The core of the agricultural industry is feeding the world, young leaders have a huge role to play in advocating for their industry by helping to bridge the gaps between scientists and producers, and the public and policymakers. 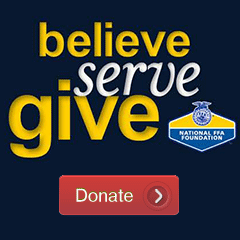 Becca Harrison is a former member of Cobleskill-Richmondville FFA chapter in New York. She is currently a senior at Cornell University, studying animal science and international agriculture. Her studies have taken her from India to the White House and you can follow her adventures on Twitter @_beccaharrison.